A non­profit, voluntary organization that is committed to the development of a body of high­quality, professional, certified Early Childhood Educators. It demonstrates a commitment to continuing professional growth that is based on reflective practice; that is, examining one’s own teaching practice, and seeking feedback from other professionals in our field. Early Childhood Educator certification is an examination of your practice that takes at least nine months. Each candidate works as part of a group of three candidates, called a Triplet. You are eligible for certification if you work directly with children for a regular amount of time per week, at least nine months of the year, or work directly with children as a substitute. Click below for a complete listing. We are a non­profit, voluntary organization that is committed to the development of high­quality, professional, certified Early Childhood Educators. We hope that you will take the time to browse through our site in order to understand the certification process and all of its benefits for ECEs. On a personal level, certification is a path to greater professional development through the examination of our teaching practices. Certification is a form of recognition that you have successfully integrated and applied the body of knowledge that you acquired through your training as an ECE. Becoming certified acknowledges that you are living up to your own standards and ideals and that your peers have recognized the quality of your work. On a broader level, certification provides a high standard for early childhood professionals and will help to improve the quality of care for children in Nova Scotia. It will reassure parents that individuals who have been certified have reached a standard of excellence, and will demonstrate that early childhood professionals are credible professionals. Certification means more than ‘being trained.’ It demonstrates a commitment to continuing professional development that is based on reflective practice; that is, examining one’s own teaching practice, and seeking feedback from other professionals in our field. Early Childhood Educator certification is an examination of your practice that takes at least nine months. Each candidate works as part of a group of three candidates, called a Triplet. The Triplet is supported through their journey by a Mentor, a Validator, and the Executive of the Certification Council. Have at least two years’ experience working directly with children. 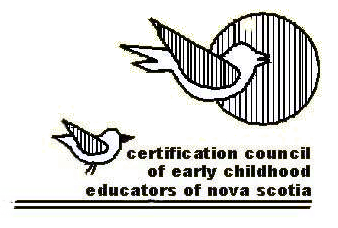 Are a graduate of a recognized Early Childhood Education program as offered in the province of Nova Scotia or that meets the Standards as set by the Department of Education and Early Childhood Development/Early Years Branch.